Posted on March 20, 2019 March 20, 2019 by Eric D. Brown, D.Sc. When working with data and modeling, its sometimes hard to determine what model you should use for a particular modeling project. A quick way to find an algorithm that might work better than others is to run through an algorithm comparison loop to see how various models work against your data. In this post, I’ll be comparing machine learning methods using a few different sklearn algorithms. As always, you can find a jupyter notebook for this article on my github here. I’ve used Jason Brownlee’s article from 2016 as the basis for this article…I wanted to expand a bit on what he did as well as use a different dataset. In this article, we’ll be using the Indian Liver Disease dataset (found here). This data set contains 416 liver patient records and 167 non liver patient records collected from North East of Andhra Pradesh, India. The “Dataset” column is a class label used to divide groups into liver patient (liver disease) or not (no disease). This data set contains 441 male patient records and 142 female patient records. Let’s get started by setting up our imports that we’ll use. Next, we’ll read in the data from the CSV file located in the local directory. If you do a head() of the dataframe, you’ll get a good feeling for the dataset. We’ll use all columns except Gender for this tutorial. We could use gender by converting the gender to a numeric value (e.g., 0 for Male, 1 for Female) but for the purposes of this post, we’ll just skip this column. The ‘Dataset’ column is the value we are trying to predict…whether the user has liver disease or not so we’ll that as our “Y” and the other columns for our “X” array. Before we run our machine learning models, we need to set a random number to use to seed them. This can be any random number that you’d like it to be. Some people like to use a random number generator but for the purposes of this, I’ll just set it to 12 (it could just as easily be 1 or 3 or 1023 or any other number). Now we need to set up our models that we’ll be testing out. We’ll set up a list of the models and give them each a name. Additionally, I’m going to set up the blank arrays/lists for the outcomes and the names of the models to use for comparison. We are going to use a k-fold validation to evaluate each algorithm and will run through each model with a for loop, running the analysis and then storing the outcomes into the lists we created above. We’ll use a 10-fold cross validation. From the above, it looks like the Logistic Regression, Support Vector Machine and Linear Discrimination Analysis methods are providing the best results (based on the ‘mean’ values). Taking Jason’s lead, we can take a look at a box plot to see what the accuracy is for each cross validation fold, we can see just how good each does relative to each other and their means. 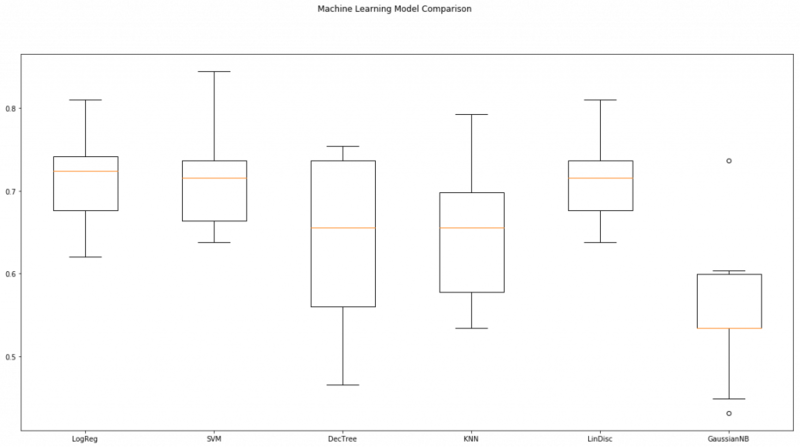 From the box plot, it is easy to see the three mentioned (Logistic Regression, Support Vector Machine and Linear Discrimination Analysis) are providing the better accuracies. From this outcome, we can then take this data and start working with these three models to see how we might be able to optimize the modeling process to see if one model works a bit better than others. I use tpot that is a Python Automated Machine Learning tool for this purpose. Thanks. That looks like a useful tool. I will take a look at it.